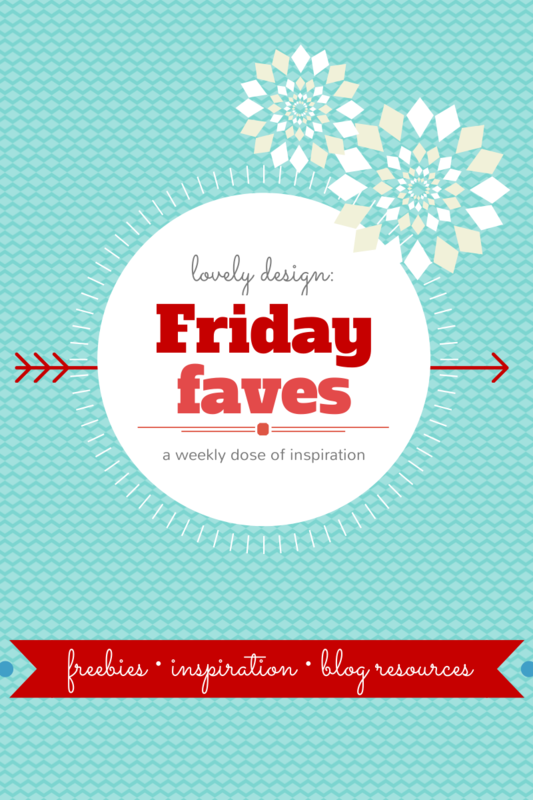 Learning how to design your own blog can be fun yet frustrating at the same time. But then sooner or later you learn that in order to make certain changes to your blog’s theme or template, like changing colors, customizing a form, fitting your header in correctly, etc. it becomes necessary to alter a bit of code in something called a Style Sheet. If you happen to fall in the latter camp, this post is for you. I want to help you understand this anomaly they call CSS and it’s counterpart HTML once and for all, because honestly, they’re really not as complicated as they seem. REALLY! 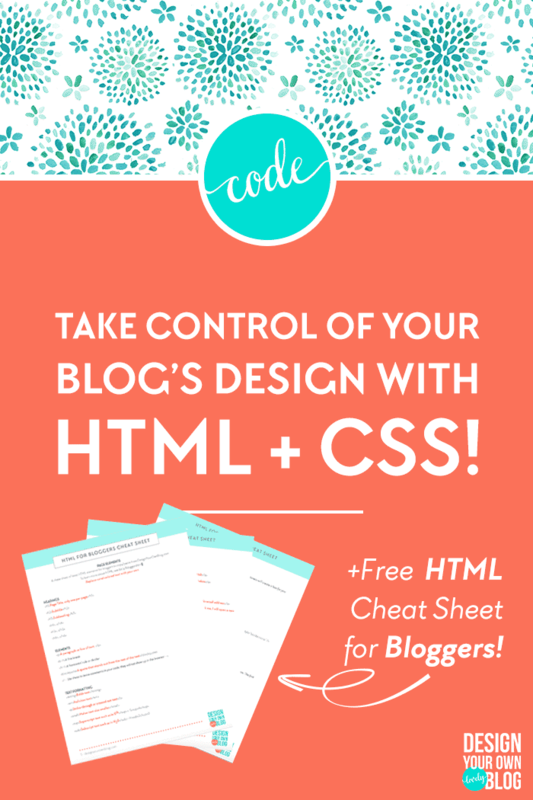 First, download this free HTML just for Bloggers Cheat Sheet! *These are affiliate links which will earn me a small commission if you purchase with this link. I thank you for your support. Read my disclosure here. HTML and CSS Design: Say What? HTML and CSS are programming languages for the web. Wait! Don’t get scared off yet! They’re not like complicated programming languages. They are separate languages that work together. HTML + CSS = BFFs if you know what I mean. HTML stands for Hypertext Markup Language which, at it’s most basic definition, means Interactive Text. It is the code that’s used to build the structure of a web page. CSS stands for Cascading Style Sheet, which is used to define the styles that format the web page. You can have HTML without CSS (that would be really ugly! ), but you can’t have CSS without HTML. CSS is applied to the HTML. HTML is the content of a webpage. So think of it like a Word document where you have all of your content (headings, subheadings, paragraphs, bullet points, etc). CSS is the style or appearance of that content. So CSS is kind of like the editor that tells what color, font and size each bit of text should be and also where to place it. 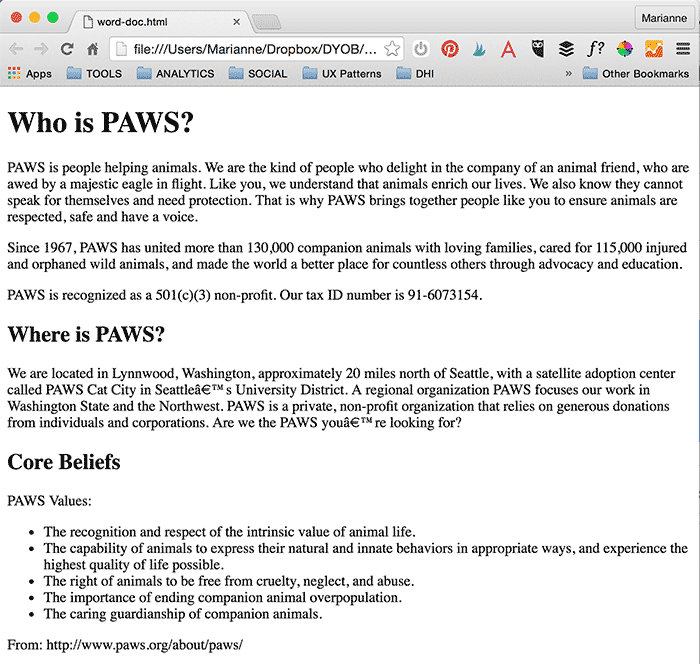 We can also use CSS to actually place things around the page. HTML and CSS should always be kept in separate files. While there are ways to include CSS in an HTML document, the best practice is to keep it in its own separate document that the HTML document links to. Let’s see HTML in action. Let’s take this Word document. 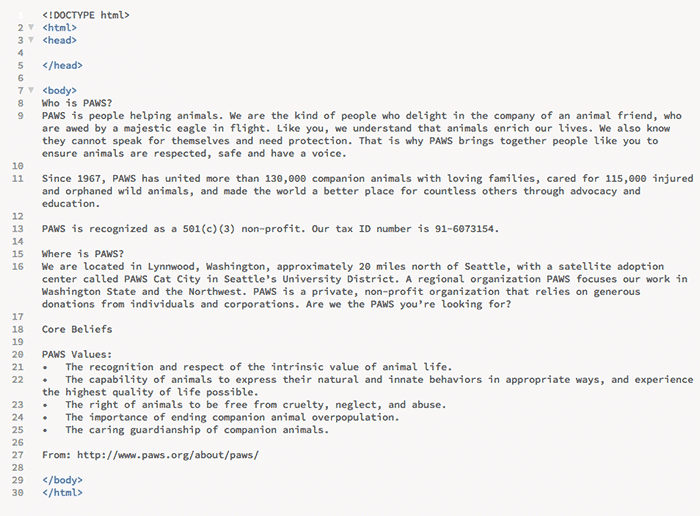 Notice how it’s formatted with titles and paragraphs, bulleted lists, bold text, etc.? All the formatting is gone, right? So how do we add this back in? With HTML tags. HTML tags will help us to structure the content on the page. Starting to look a little better right? Did you notice that the headings are automatically bigger and bolder than the rest of the text? And that the paragraphs automatically have line breaks and margins added after them? Without any CSS style definitions added to an HTML document, a browser will automatically add some styling to certain elements to give the content some sort of structure. I think we can agree that although some styling is better than none (see first screenshot up above), it still has a long way to go. More on that when we talk about CSS another time. 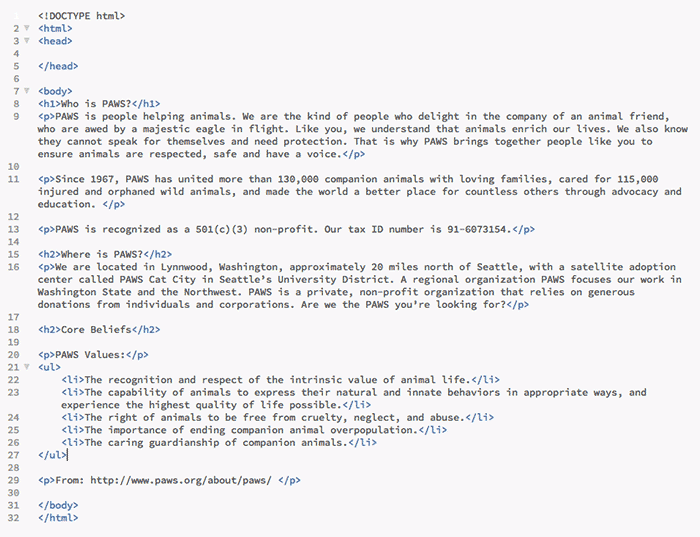 Tags surround each separate element on the page: like the headings, paragraphs, bulleted list, etc. The <p> tag defines paragraphs. The <ul> tag defines a bulleted (or unordered) list and the <li> tags define each item in the list. If you wanted to show a numbered list instead, you would simply use <ol> for ordered list instead of <ul>. You should know the basics of HTML. 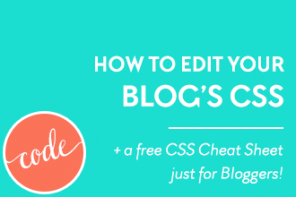 Learn it quick with this free cheat sheet just for bloggers! If you compare our Word document to our HTML page in the browser again, you may notice that we missed a few things like bolded text in the second paragraph, italicizing in the third, two hyperlinks, and some right-aligned text at the bottom. 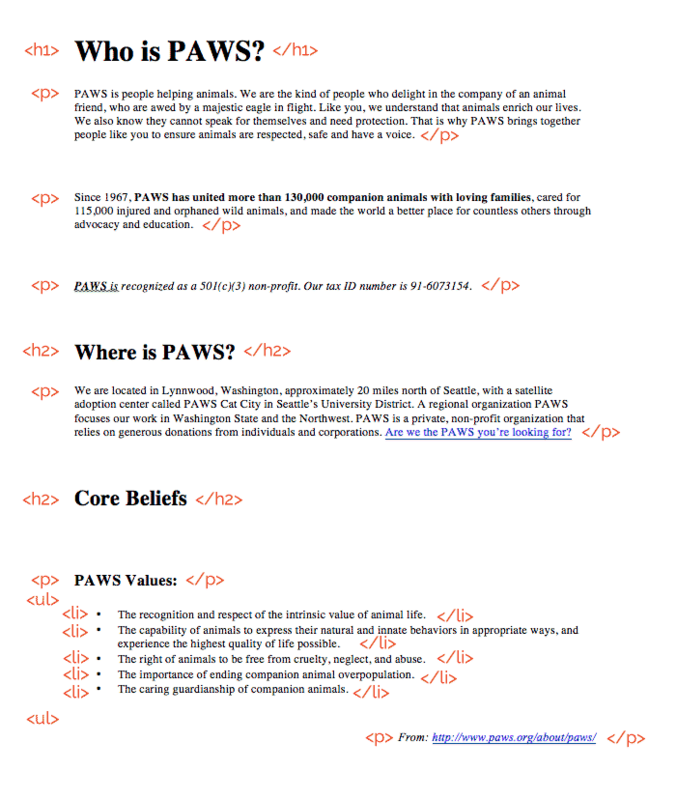 Since 1967, <strong>PAWS has united more than 130,000 companion animals with loving families</strong>, cared for 115,000 injured and orphaned wild animals, and made the world a better place for countless others through advocacy and education. The href stands for hypertext reference and is an attribute added to the a tag. It defines the URL that you want your link to go to. The URL must be between double quotes as shown above. How About a Free CSS Workshop? If you enjoyed this post, be sure to join me for my free 4 part video series on learning CSS. 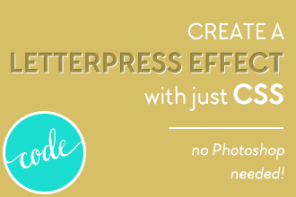 It’s tailored just for bloggers! Then click right on over to CSS 101 for Bloggers . o wow thanks so much! i was just looking into online classes on learning HTML and Css. You are so right when you get started you feel like you can get along with out it but as you get more serious you realize i will never get the look i want if i don’t learn how to code myself. Thank you Barleo, I think a lot of bloggers realize that and some think it’s just too difficult to learn so they never do it. I want to show people how easy it is to understand! Glad I could help and hope you enjoy the next couple of posts! Do you have a link to a css generator free basically you put in content put the settings as you want then it makes it done with the css coding to go with it? Hey Michelle, there are a few CSS3 generators out there and this one is perhaps the closest to what you’re asking for: http://enjoycss.com/ Let me know what you think of that one. Awesome! Even though I’ve had my blog for 3 years, I’m still scared of HTML and CSS. This will help so much. Thank you, thank you! Hi Sascha! I’m showing that it was sent to you on 3/14 but you haven’t opened it yet. Try checking your spam folder if you don’t see the email in your inbox with the following subject line: ‘Here’s your FREE HTML cheat sheet access.’ If you don’t find it, let me know! I really love your blog, but I’m having the same problem! I subscribed to download the cheat sheet, but the landing page still tells me to subscribe. Am I missing something? I went on and entered my email again to subscribe, but nothing happened. This was very easy to understand and I am confident to move on and work at it more. Great job! Pinning this post. 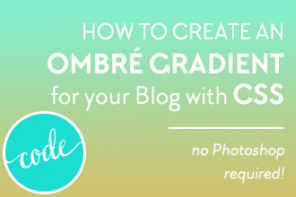 I think a lot of bloggers will find this guide handy! You’re absolutely right Tiffany! I just want people to give it a chance because it really is quite intuitive and not that hard to pick up. This is going to be a fun series I can tell already! Great post. Marianne. I always know when you send an email that it’s going to be well worth it. Sometimes in your case less is more! First off, I love your website. The design is absolutely beautiful. Second, I am so happy that you covered this topic. As a graphic designer, it’s so hard for me to get other artists to see how to take control of their brand by learning design basics like css and html. I know it is intimidating but it really is necessary if you want to take your brand to the next level as hiring a designer can usually get expensive. What makes this post so wonderful, is not alot of people want to walk through the basics because it ends up being a super long post. Thank you for taking out time to write this. Will definitely have to share this! Thank you so much Natasha! I’m so glad you think so, especially knowing it yourself already. I do want to make learning it as clear and simple as possible because it really is so important, like you said, for designers and bloggers to know! The best explanation thus far!!!!!! So easy to understand! Thanks for sharing! Thanks so much Sascha! I’m so glad you found it easy to understand! That makes me feel good about the workshop I’ll be offering! I’m also having problems with the pop up. It stays shaded & disappears when I try to enter my info. Marianne, it finally worked – thanks. Oh good! I’m not sure why it’s doing that. Not sure if it’s something on my end or ConvertKit’s, will have to do a bit more research. Of course it doesn’t help that I can’t seem to recreate the issue! sigh….. thanks for letting me know though! Finally! Something that explains it in terms I can understand. I’m so grateful to have seen this post! Awesome Florence, that makes me so happy to hear! It’s really interesting to see how the tags work. Although I’m wordpress self-hosted and so it’s all done for me, it’s always good to know in case of a hiccup! Thanks. Hey Carol, I’m glad it makes sense! I’m on self-hosted WP too but I still use HTML to do custom layouts on some of my pages and also to build my own landing pages. It also helps to understand when things don’t look right and you can’t figure out why. Knowing what to look for in the page inspector is super helpful! I can’t download the link. Hi Lenze, the PDF download is sent via email once you subscribe and then confirm your email address. Can you be more specific about what’s happening when you try to subscribe? Hi Emma, can you try it again and see if it works now? The pop up for this when I click in the field to type makes the pop up disappear. I have pop ups allowed for it so that is not the issue. So I cannot get the CSS cheat sheet by that method. Also trying tonfownload your free items seems to be difficult since no matter what I do it always takes me to pinit and never will get to download. Hi Kyu, sorry you are having issues with the popup. I never thought to test it on my tablet, but you’re right! It doesn’t seem to work, I will look into it. In the meantime, I’ll email you the cheat sheets. Sorry about the inconvenience, but thanks for subscribing anyway! Also, thanks for letting me know about the Pin It buttons being an obstacle on the library page. I have removed them so it should be easier to download the items now. Your Blog is BEAUTIFUL! I just found it and am super excited to read everything! Keep up the great work! I could only dream of having a blog a quarter as nice as this! 🙂 As well all the tips to help us little guys, thank you for that!!! Awww Tay, thank you so much, that means a lot! Great article. Too many people rely on website builders these days. You really need to learn html and css for any custom coding for your website. Too many website builders are also horrible for search engine rankings. Learning to code you can build your own website with SEO in mind. Definitely a good skill for anyone to have in their back pocket! Hi Marianne, this is the first time I have actually understood HTML and CSS. you made it so easy to understand thank you so much! I’ve been fudging my way through html and css whenever I needed to over the last few years and this is the easiest way it’s been explained to me! Thank you so much for super easy and simplified explanation… looking forward to the rest in your CSS video series! Hi Lauren, I am so glad you found it so easy to understand. Thanks for watching the video series! Nice informative post! Thanks for sharing the beneficial points related to the HTML and CSS. It’s really helpful for the beginners. Good job! I’m so glad it helped you Mohamed, cheers! Hi Ahmed, I cannot recreate this issue. What type of device are you using? Which browser are you using?